Combine a focused search and matching function with a massive worldwide database of users and you have Be2.com, a great forum for gay singles to find love. This is a no-nonsense site, which allows you to make your sexual orientation clear from the moment you sign up. The result is a platform which makes be2.com a gay dating site well worth using. There are some innovative features to help you get in touch with the perfect partner. There is a definite focus on finding long-lasting love and the site is designed to make it simple to navigate and maximize your chances of success. There is also a great money-back guarantee if you don’t meet a requisite number of people. Getting in touch with other members is made simple. You can use standard mail message and instant chat options. There is also a ‘flirt’ tool at your disposal. Meanwhile, if the whole process is a little intimidating, Be2 also provides pre-made questions to simplify things. If you want to find out a bit more about a member, just submit 5 questions to a potential match via the useful “Just Ask” feature. The result will give you a good overall picture of your compatibility. If you really want to make your profile stand out, then be2.com gives you the opportunity to add a video profile. The most outstanding feature is the personality test. More of that to come. 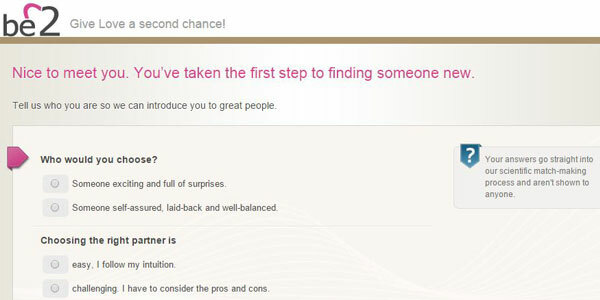 The result though is that you will only be matched with members who are a genuinely good fit. As any Be2 gay review will tell you, the sign-up process is the crux of the system. The very first thing you will be asked is your gender and the gender you are looking to be matched with. As a result, you are guaranteed to be matched only with gay singles. The rest of the search and matching process merely narrows down the field. You will be asked for standard personal information, such as date of birth, physical appearance, religion and attitudes to smoking, drinking, etc. However, what makes Be2.com stand out is the personality questionnaire, which is based on a psychological and scientific model. Like Zoosk, this is a site which goes beyond the standard personal questions to explore your personality. The questions take around 10 minutes to answer and ask you to rate personality traits and how you behave in a relationship. The whole model was revised in 2013 and the result is an effective system. All that is left is to upload a photo and you are free to begin your search! Be2 really is a joy to use. The site itself was re-designed in 2013 and is now a streamlined, no-nonsense platform. The focus is on simplicity, making the platform as easy as possible to use. For a start, it is very pleasing on the eye, with a gentle mauve on cream color scheme. Direct from your personal dashboard, you have direct access to your profile, potential matches and your inbox, via tabs at the top of the page. Meanwhile, the sidebar shows you exactly who has just joined the site and gives you access to your favorites lists. Interestingly, there are several ways to find a suitable match. Firstly, you can conduct a standard search. The quick search allows you to find someone using variables such as age and height. The advanced search widens these search terms remarkably and as a result you can look for someone based on location, ethnicity, religion and attitudes towards smoking and drinking. There are other methods to find someone too. It is well worth running a “Compatibility Report” on someone who grabs your interest. Based on your respective answers to questionnaires and quizzes, you will find out the chances of being a successful match. Meanwhile, boosting b2.com’s gay dating credentials, the “Just Ask” feature is a great way to ask more detailed questions of a potential match in relation to your own identity and to work out their compatibility for yourself. Free members can create a profile and browse the site. However, if you want meaningful functionality and real results, then you will need to become a paid member. This will allow you to contact members freely, send and receive text messages and see who has viewed your profile. Membership for 3 months costs $66.60 per month, a 6-month package will set you back $33.30 monthly and a 12-month deal costs the equivalent of $16.60 each month. However, if you are a paid member and have not got in touch with at least 10 members during your plan, then be2 offers a full refund! This is not a dedicated gay dating site, like Compatible Partners. Nonetheless, as any Be2 gay dating review will tell you, this is a great gay dating platform. 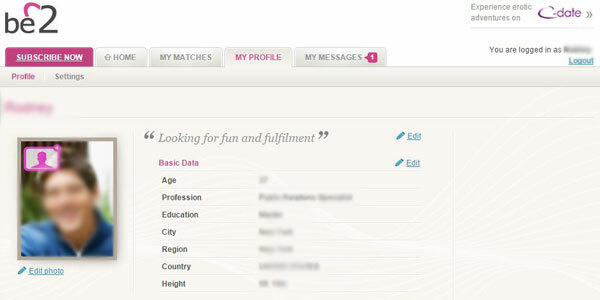 Similar to Match, this is an extensive dating site and there are more than 30million users in 37 countries. As a result, there should be plenty of gay singles out there. The search process is geared up for it. Be2 is aimed at generating serious relationships. If this is what you’re after, then it might be the site for you. Quite simply, this is a well-organized, comprehensive dating site which is a great platform for gay singles. With numerous useful features, a simple-to-use design and a massive database of users, it is well worth checking out.